In tomorrow evenings 4th episode of 'S Ann An Ile on BBC Alba we (well, those of us in the UK able to see it) can see how ‘Duncan's childhood dreams come true as he begins to restore a traditional 'Para Handy' puffer.’ I wrote about it in the Islay and Puffers entry in January and in the entry about the Crinan Canal said I hoped to take a look at it. 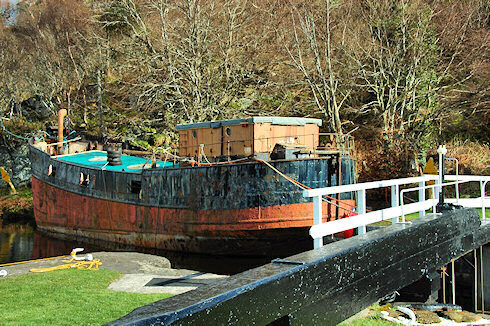 On the way to Islay for my recent visit in April I did manage a short visit to Crinan at the western end of the Crinan Canal. The puffer is a very short walk up the canal, just past the lock. 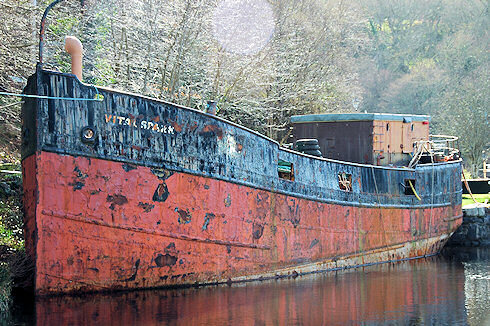 If you compare it to the pictures from the The Vital Spark's last journey up the Crinan Canal set on Flickr you'll see that progress is being made. I spoke to Para Handy this week and he informs me that work is proceeding well on VIC27. The old boiler has now been taken out, the steam engine has been stripped down and is being rebuilt and she will shortly be taken out of the water for major replating work. That sounds promising, fingers crossed all the work will go to plan. 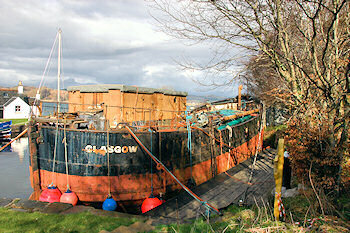 I think it would be great to see her cruising the waters around Crinan and Islay again. May be with Duncan at the wheel?